I decided today that starting next week I am going to use Confessions of a Homeschooler's Letter of the Week curriculum for John John. I figured that it would give me a good basis for activities each week and then I can add in activities when I am feeling creative and have the time. I have really been slacking with him and feel pretty bad about it, so now that the holidays are over (and hopefully our house is back together after putting down wood floors!) I can get back in gear. So, for A is for Apple, I made up a game to practice counting. John goes to Nana's every Monday and they go feed donkeys and horses apples. John LOVES it and when we say anything about going to Nana's, he immediately says 'Feed donkeys, feed horses. Cut apples.' 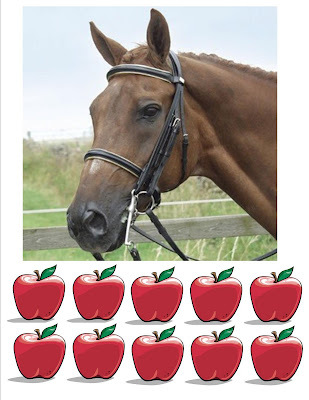 So I thought I would make him a game where he feeds a horse apples. 1. Tape the picture of the horse (images are below!) to the front of an empty cereal box. Cut a slit for the mouth. 2. Print and cut out the apples. 3. John will draw a number from a pile (can write the numbers 1-10 on small sheets of paper, can print them out, or can even just call out a number if you are in a pinch!) He will have to 'feed' the horse that many apples. If you try this before I do next week, let me know how it goes and if you have suggestions for changes! So cute. We already did A awhile back, but I will put this in my files for next time around! Thanks!